There’s some exciting news on the Prosio Communications front! The Sacramento Business Journal recently announced the list of 2016 Top Ranked PR and Advertising Agencies in the region, and Team PC earned a spot on both lists! 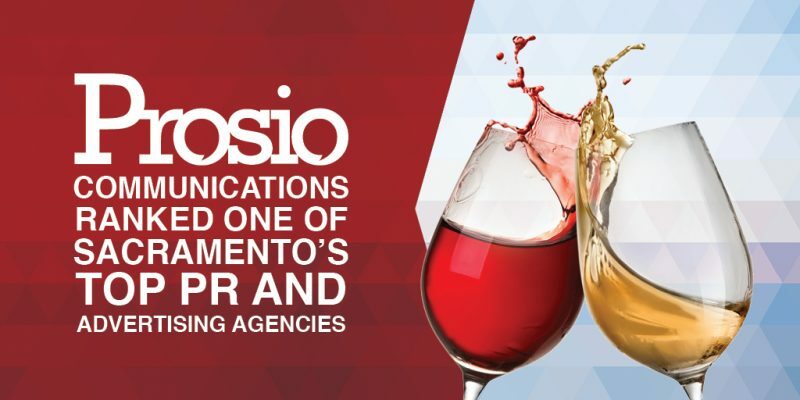 That’s right – Prosio Communications was ranked the 7th largest PR agency, placing us up two spots from number nine the prior year. And for the first time since the business was launched in 2013, we placed on the largest advertising agency list, too – coming in at number eight! We are proud to be on both of the lists, and among some great friends and colleagues in both industries. As if this news wasn’t already sweet enough, PC was also recognized as one of Sacramento’s Best Places to Work, fastest-growing businesses and largest minority-owned businesses! We’re thrilled to hold the number seven spot on the Fastest Growing list, and number 16 on Largest Minority-Owned Businesses, landing alongside some other really great local companies. We appreciate all of the support we’ve received from our clients, vendors and partners over the last few years, and we’re looking forward to many more years of success! Cheers!